News about several major publishers delaying e-Book releases in 2010 have been circulating for some time and eventually made it to Wall Street Journal (article about Simon & Schuster and Hachette Book Group, article about HarperCollins). In case you haven’t heard, several major publishers are adopting a policy of publishing digital versions of certain bestsellers (the most frequently mentioned being Sarah Palin’s “Going Rogue”) several months after the hardcovers on which publishers typically made significant chunk of profit. Unfortunately for the publishing industry the train may have already left. e-Book readers are probably the most wanted Christmas gift. Nook and Sony readers are sold out. Amazon Kindle not being sold out is a small miracle giving it’s killer sales in November that (I guess) are going to be topped by December sales. Sweet $9.99 price point may be only part of the reason. Let’s not forget that in order to enjoy cheap e-Books you need to make the initial $200 investment in eBook reader device (reading on PC and iPhone may get you hooked but after some time most likely you’ll either go for eInk or drop reading e-Books altogether). For me personally the biggest reason for choosing e-Books over paper books is convenience. I will not go into details here about I find e-Books convenient – just read this blog. While book reading was declining for years now, e-Books have revived it. So why would publishers so desperately want kill the very thing that seems to be saving the books? Because they don’t control it. They have been comfortable with the old model of chopping trees and making books out of them for authors and then promoting these books because authors didn’t have the resources to do it themselves. The system has worked for centuries until the Internet arrived. With Internet you no longer need to chop trees to get your word out to large number of people. The concept was out there for anyone to see for years but publishers ignored it. It’s hard to blame them – when you have a well-oiled machine that has been generating cash for centuries it’s hard to always stay on your guard and constantly look for ways to improve the machine. After all there is always the risk of the breaking the machine instead of making it better. And this works… until someone else who is a newcomer and has nothing to lose comes by and completely reinvents the machine. That’s just the way everything evolves. With Amazon Kindle publishers don’t control the final price. Amazon is cutting in their current profits by selling the e-Books for $9.99 to establish a market share. Once the market share becomes big enough, Amazon can then either raise the price or tell publishers to lower their cut because then it will be “digital sales or no sales at all” Publishers understand this all to well but they will not be able to turn the tide. While they may succeed in thwarting Amazon’s attempt at becoming a e-Book monopoly, 10 years from now most of the books will be digital (whether though Amazon, Google, B&N, Sony monopoly or no monopoly at all) – there is no doubt about it. With technology advancing as rapidly as it is, using paper hauled by fuel burning trucks to transfer information seems as outdated using horses to plow the field in the age of tractors. I have no illusions – eInk is not perfect – far from it in fact. We already have Mirasol displays coming in color e-Book readers in 2010. Then there’ll be some other technology. But even today’s imperfect eInk and DRM digital books beat the heck out of paper books in many aspects. If new hardcover titles continue to be sold as $9.99 e-books, the eventual outcome will be fewer literary choices for customers, because publishers won’t be able to take as many chances on new writers. While fewer new artists may be exposed now, I don’t feel a shortage of music that I like to listen to. In fact I like the fact that major MP3 music retailers like iTunes, Zune and Amazon offer DRM-free music that now plays on my PC, XBOX360 (that I use as media center), iPhone and MP3 car stereo without useless limitations. It may be more correct to say that publishers will get fewer chances with new writers since e-Books open self-publishing possibility to anyone. Publishing industry has my sympathies, they do not have my wallet though. Personally I’m so hooked on e-Books, that waiting for several months for digital version is not a problem for me at all. The book will be as interesting for me to read in a couple of months too and meanwhile there are other books that I haven’t yet read. The situation is similar to DVD and Blu-Ray disks coming out months after theatrical movie releases. The idea is not to cannibalize movie ticket sales by giving people the ability to watch the same movie at home. I might be a non-typical consumer but for the this dilemma is resolved in exactly the same way – I wait for DVD release while I watch other movies that were already released. Truth being told I’m even to lazy to go to local Blockbuster or even my mailbox for that matter. If I can get the movie via Zune Marketplace or Netflix “Instant Watch” on XBOX360 that’s what I do. It’s not that I’m ultra-greedy and don’t appreciate movie theaters. I do. But my schedule just doesn’t allow me to go to the movies that often. And movies that I really cared about like “Lord Of The Rings” and “Star Wars” I watched in the movie theater regardless because this is the right way to watch them for the first time. Period. 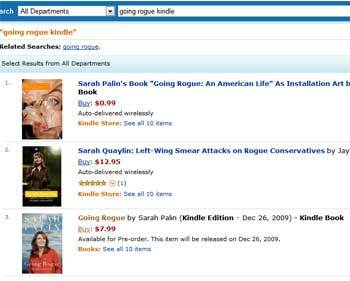 Getting back to the Sarah Palin book… If you search of “going rogue kindle” on Amazon you get an interesting list of results: the Kindle edition of the book that is currently available for pre-order for $7.99 (I guess this is Amazon’s way of giving customers extra incentive to wait for the digital version) ranks 3rd after 2 books that are available for sale right now that are only remotely related to the original book in question. These books may be ranking higher because they sell while the book customers really want is stuck on pre-order. So while publishers may be gaining some hardcovers sales, they are also loosing sales to different books that aren’t on a several month hold. PS: Although I find e-Book reading more convenient, there are some places Kindle or any other eBook reader can’t go. I read paper books to my daughter as she goes to sleep and during the day. Even if I had 12″ color e-Reader with LCD-like response time, 3D holographic animated pictures and surround sound, I still don’t envision myself “reading” it to her. Some books will stay on paper for quite some time just as we still have sail-boats in the age of affordable air-travel and combustion engine.